Wearing neutrals just makes me swoon about summer. It's light, fresh and modern. Summer will be here in about 6 weeks peeps and I'm counting :) Wearing all neutrals is about texture and picking the right shade. I'm a fan of whites, ivory and grays. Since the weather will be slipping on its fancy 70 degrees and up temperature our way, here are a few of my "how to" tips to rocking all neutrals and keeping your cool. Texture is your friend. 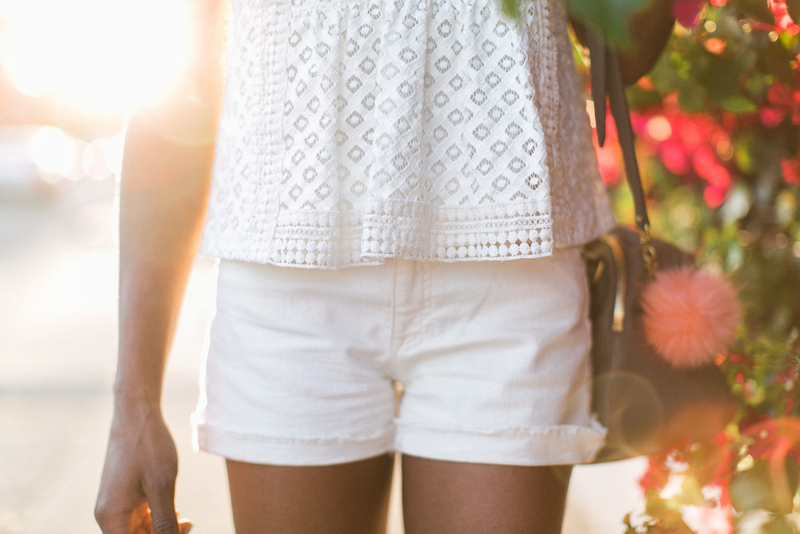 I'm wearing these ivory denim shorts from JCrew and paired it with this darling eyelet top from Banana Republic. The eyelet gives this color palette some texture and makes the outfit more playful. By the way guys, this top was on super sale in the store so go snag yourself one now :) The ivory top was a bit darker than the shorts but this is why having texture is so great. The shades do not have to be an exact match, which makes pairing easy. Mama likes that! Accessorize to add a little something something ;) I paired this grey bag from JCrew ( so cute right) and my little coral puffball name Javi ;) to give the all ivory look some anchor. When it comes to styling myself and my clients, looking great should be a simple and easy process. Neutrals allows this ease because you don't have to worry about matching or coordinating since you're using the same color palette. They all play nicely with each other.